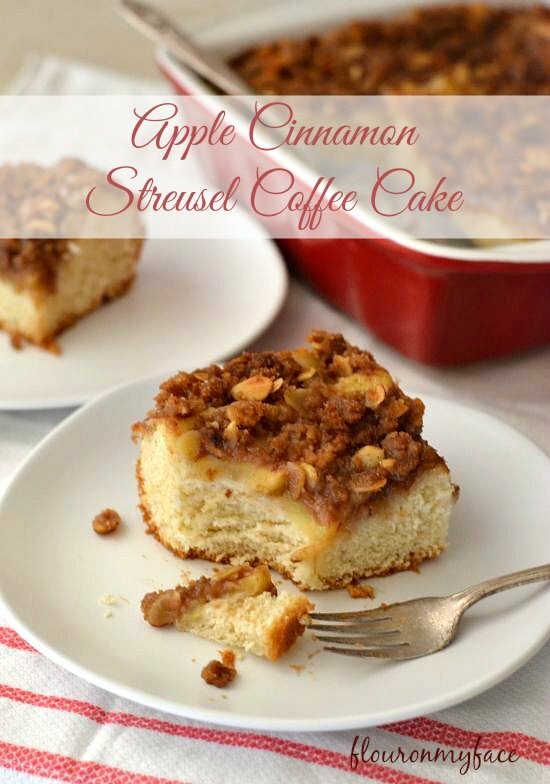 Disclosure: This Apple Cinnamon Streusel Coffee Cake recipe is a sponsored post. 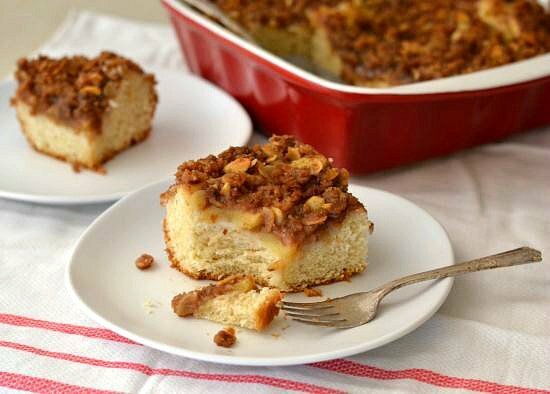 This easy Apple Cinnamon Streusel Coffee Cake is an easy and perfect fall recipe. Now that apple season is in full swing it’s time to find some sweet and easy homemade dessert recipes using apples. This easy Apple Cinnamon Streusel Coffee Cake takes only 30 minutes of rising time thanks to Fleischmann’s® RapidRise® Yeast. Baking with yeast doesn’t have to be intimidating. Fleischmann’s® RapidRise® Yeast makes it easy to make a delicious holiday dessert. Have you ever checked out the Fleischmann’s® Bread World website? 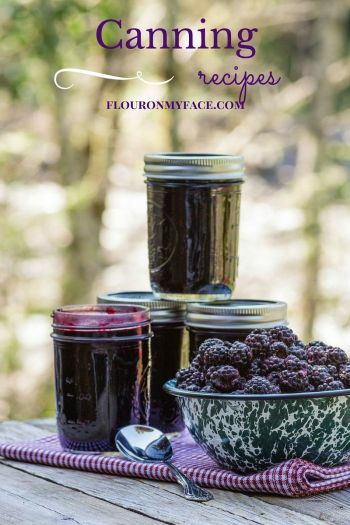 It is loaded with easy yeast recipes that anyone can make and even has an area where you can learn everything you need to know about baking with yeast. The inspiration for this Apple Cinnamon Streusel Coffee Cake comes from one of the easy yeast recipes on the Fleischmann’s® Breadworld website for a Beginner’s Cinnamon Streusel Coffee Cake. Back when I first started baking I would be filled with dread whenever I came across a very delicious looking recipe that called for yeast. Back then I would usually skip over that recipe and find another “easier” recipe that didn’t require yeast. Now I know how silly that was and realize how many really good recipes I missed out on for no good reason. Baking with yeast isn’t difficult at all and there really are many easy recipes that call for yeast. as long as you can mix up the ingredients like any other recipe you can make a recipe that calls for yeast. I’m going to show you just how easy it is to make this Apple Cinnamon Streusel Coffee Cake recipe with step by step photos. How to make a Streusel Coffee Cake with yeast. Scroll to the bottom of this post for the full Apple Cinnamon Streusel Coffee Cake recipe and print option. Measure the dry ingredients into a large bowl. Warm the water and oil in the microwave until it is very warm to the touch. 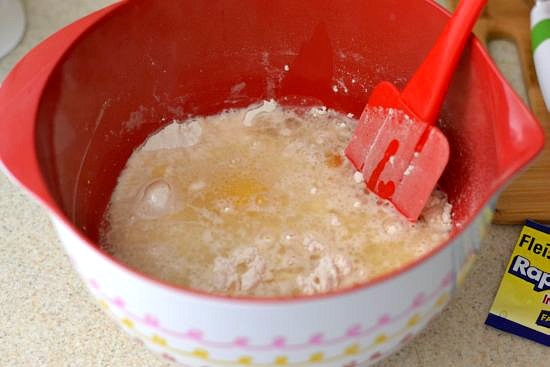 Add the water, oil, egg and vanilla to the bowl of dry ingredients. Beat for two minutes on medium. Add the remaining flour to the bowl. Beat the coffee cake batter for another 2 minutes. 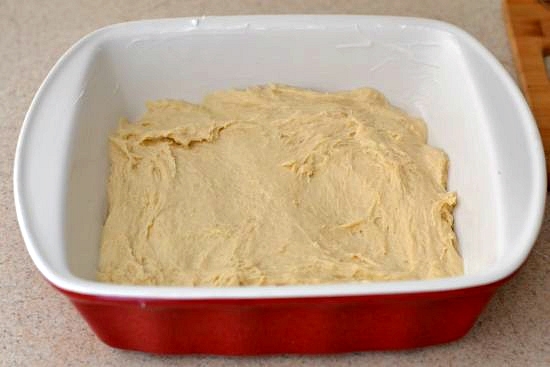 Grease a 8×8 baking dish with solid shortening and spread the batter into the pan. Cover with a clean dish towel. So far so good. There is not much difference between this coffee cake recipe with yeast than any other recipe is there? 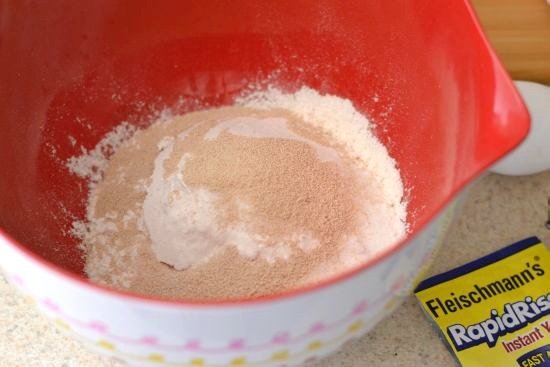 If you have never baked with yeast now you know just how easy it really is. Now this is the point in this yeast recipe when we have to let the dough rise. 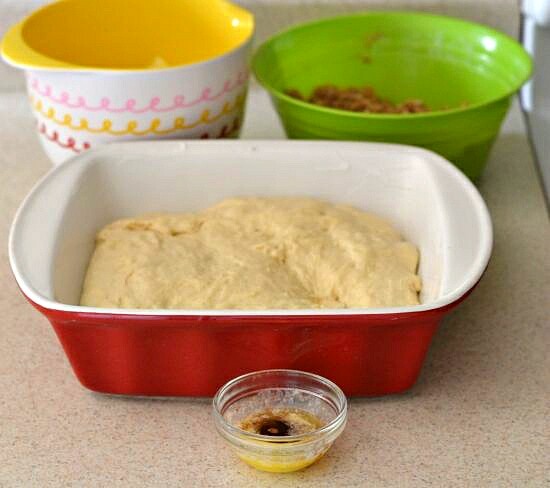 Since we’ve used Fleischmann’s® RapidRise® Yeast our dough will double in size in about 30 minutes. 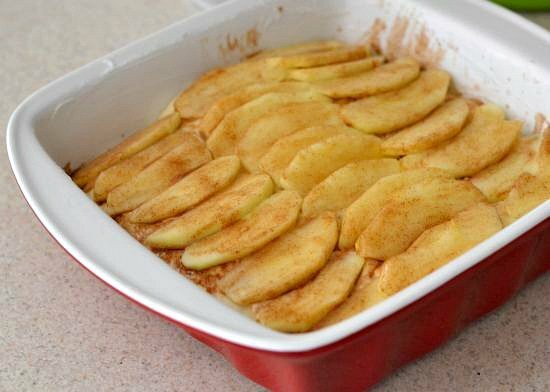 If your kitchen is drafty or cold place the baking dish in a warm area out of drafts. 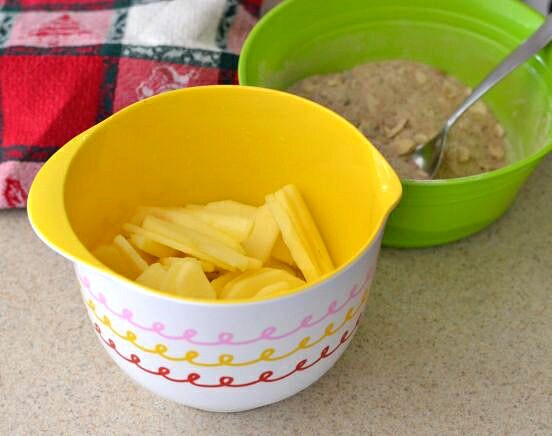 You could put it inside a microwave oven or in a cold oven. My kitchen is pretty warm so I just left the pan on the counter. While the dough is rising prepare the apples and streusel topping. 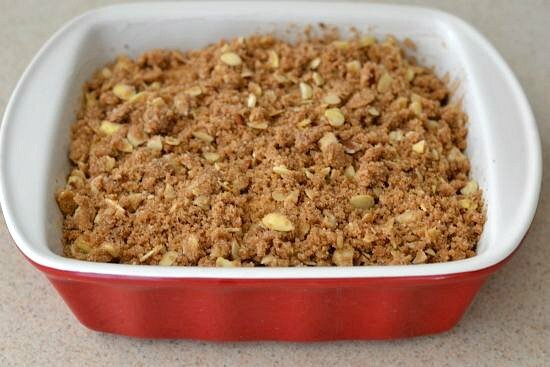 Mix all of the dry streusel topping ingredients in a small bowl. Add butter to the dry ingredients. 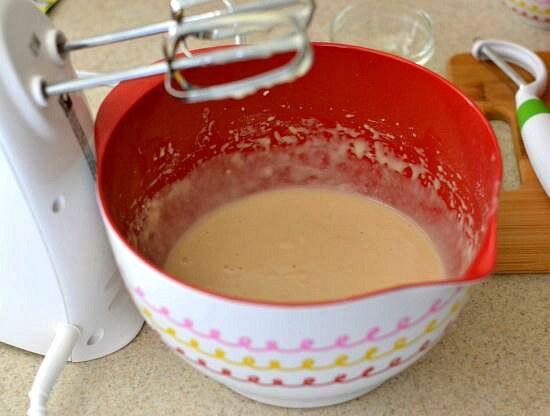 Cut the butter into the mixture with a pastry blender or your hands. 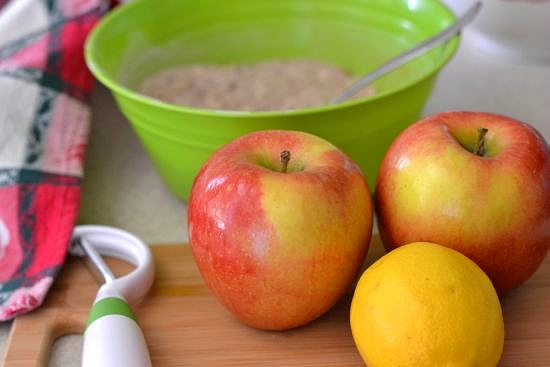 Prepare the apples by mixing with the fruit filling ingredients in a bowl. By now 30 minutes should almost be up. 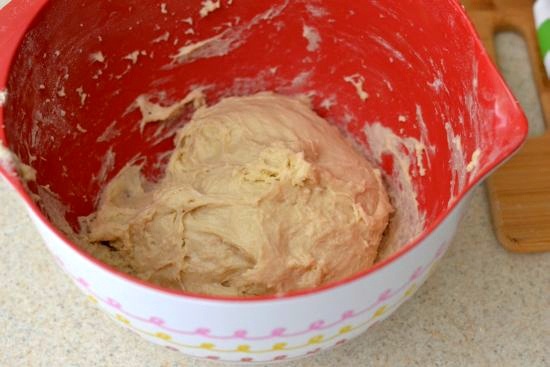 If you placed your dough into the cold oven to rise remove it and place it on the counter. Preheat the oven to 350 F. degrees. Take a peek at the dough. 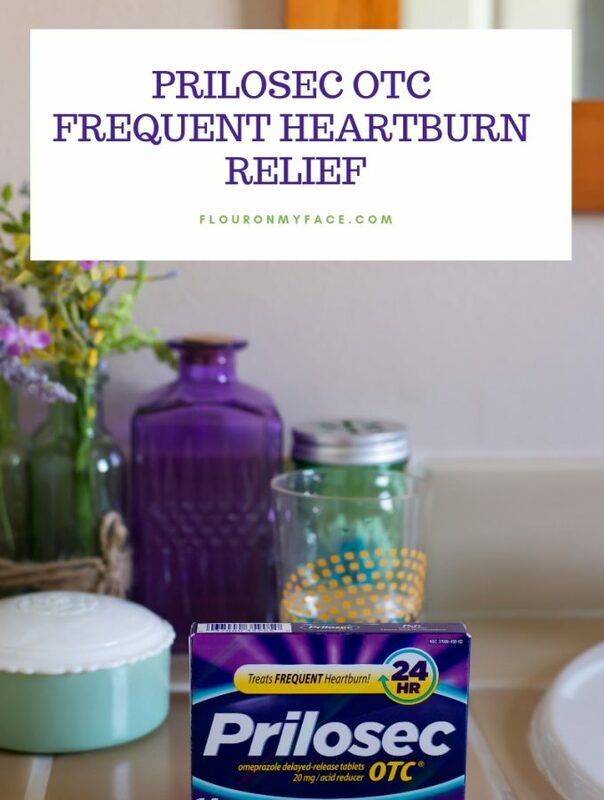 If it has doubled in size you are ready for the next steps. If it hasn’t doubled in size replace the dish towel and let it rise for another 10 minutes or so. Once the dough has doubled in size melt the 1 tablespoon of butter and add 1/4 teaspoon of cinnamon. Gently brush the melted butter and cinnamon mixture over the top of the dough. Lay the apple slices over the coffee cake dough in a single layer. Brush the apple slices with the remaining butter and cinnamon mixture. Sprinkle the streusel topping over the apple slices. Bake for 30-4o minutes or until a tooth pick inserted into the center comes out clean. If desired drizzle a simple frosting over before serving. 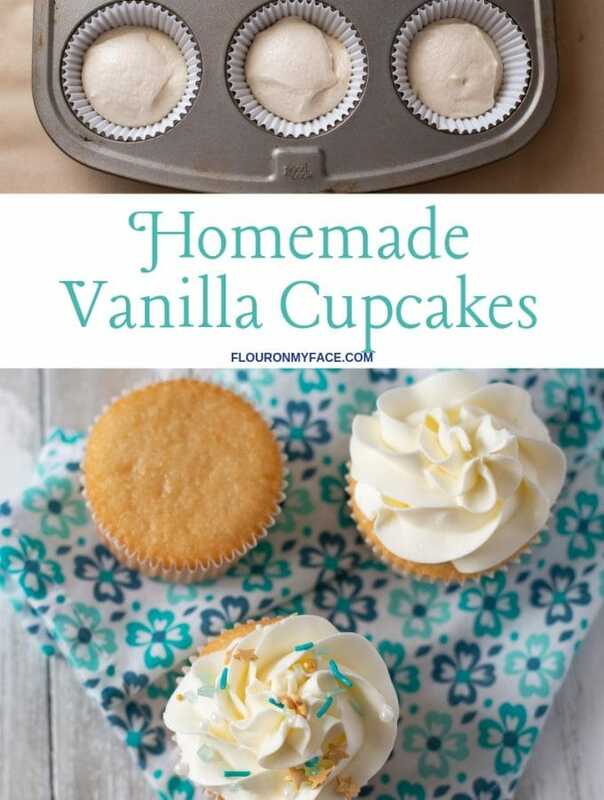 I’ve included the recipe for the frosting below. 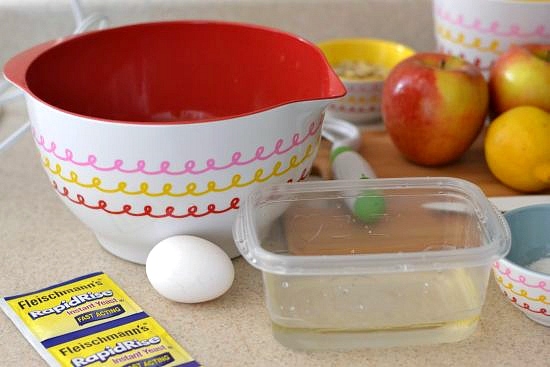 I hope I’ve shown you how easy it is to bake with Fleischmann’s® RapidRise® Yeast. There is no need to be intimidated by yeast. 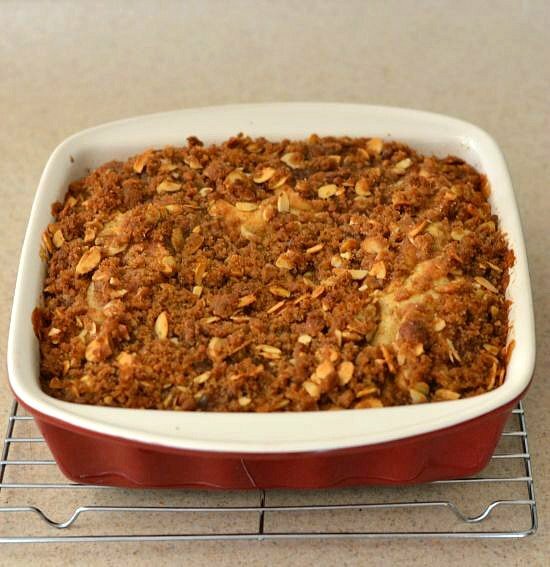 This Apple Cinnamon Streusel Coffee Cake recipe is perfect for your holiday dessert table. For more recipes that use yeast check out the Food Network Holiday Baking & Dessert Recipes page. 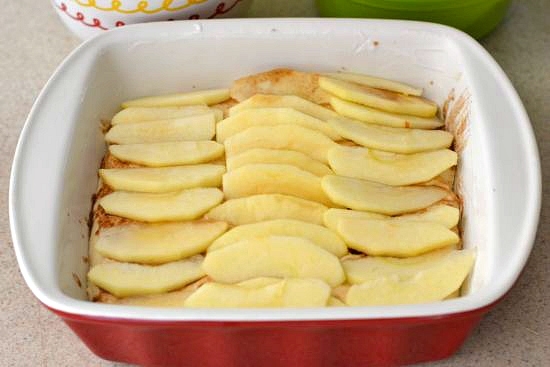 Prepare and 8 x 8 inch baking pan by greasing it or lining it with parchment paper. Mix the dry ingredients in a large bowl, set aside. 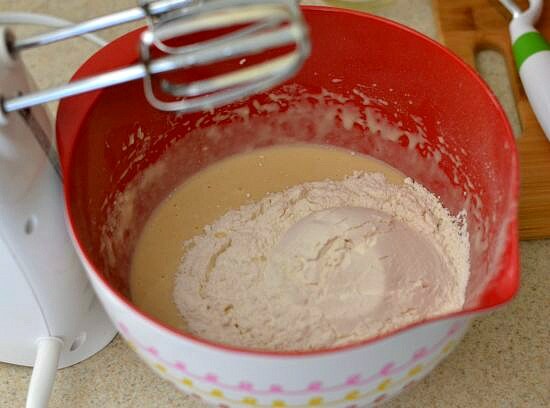 Whisk the wet ingredient in a separate small bowl. Combine the dry ingredients with the wet ingredients and with a hand held mixer beat for two minutes, dough will be very sticky. Evenly spread the dough into all four corners of the 8 x 8 inch pan. 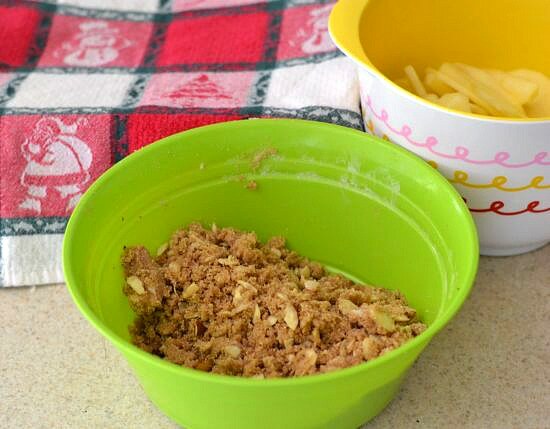 (Using a spoon dipped into warm water and pushing with the bowl of the spoon will make spreading the dough into all corners much easier!). Lightly cover the pan with a towel and allow to rise until doubled, about 20-30 minutes. While waiting prepare the fruit filling and streusel topping. Peel, core and slice the apples and mix with the remaining fruit filling ingredients in a small bowl, set aside until needed. Next mix all the struesel ingredients in a small bowl. Using your hands (or a pastry cutter) work the butter into the dry ingredients until coarse crumbs form and set aside until needed. Once the dough has risen. 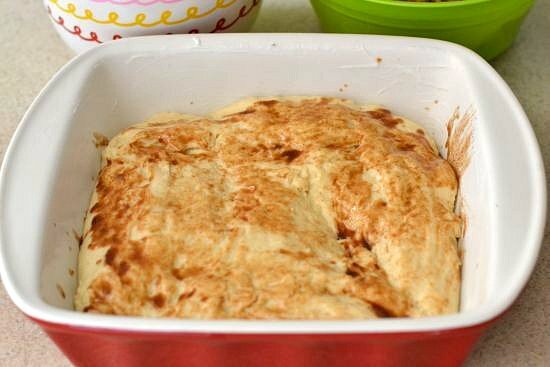 Melt 1 tablespoon of butter and mix with 1/4 teaspoon ground Cinnamon. Brush the top of the dough with the melted butter and cinnamon, reserving about 1/4 to brush over the fruit. Arrange the apple slices in a single layer over the top of the dough and pour any remaining juices from the bowl over the fruit. Brush the apple slices with remaining butter and cinnamon mixture. Sprinkle Streusel topping over the apple slices. Bake in a preheated 350 F. degree oven for 30-40 minutes or until a tooth pick inserted into the center comes out clean. Once cool prepare the frosting if desired and drizzle over the top if desired. Easy Apple Cinnamon Streusel Coffee Cake recipe made with rapid yeast for a fast (under 30 minutes) rise is a moist and delicious baked from scratch dessert recipe. 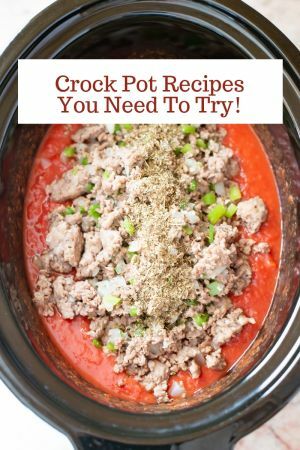 Recipe directions have been updated! Serve this delicious Apple Cinnamon Streusel Coffee Cake on your holiday dessert table or enjoy it with a cup of coffee. There’s a sense of pride in sharing something you’ve baked from scratch. With Fleischmann’s Yeast, you won’t be afraid to find your creativity in the kitchen or even get your apron a little dirty. Baking with yeast this holiday season can be as easy as pre-heating the oven. To find out more, visit foodnetwork.com/holidaybaking. I love yeast coffee cakes, but I never seem to get around to making one. No excuses with this easy version! It is so easy to bake with yeast and this coffee cake is so good and easy to make. Thanks for stopping by! This looks wonderful. I wonder if I could let it rise overnight with regular yeast in the fridge? Thank you. I bet it would work. It will take a little longer to rise because the dough is cold but in a warm spot it should rise with no problem. Such a classic! 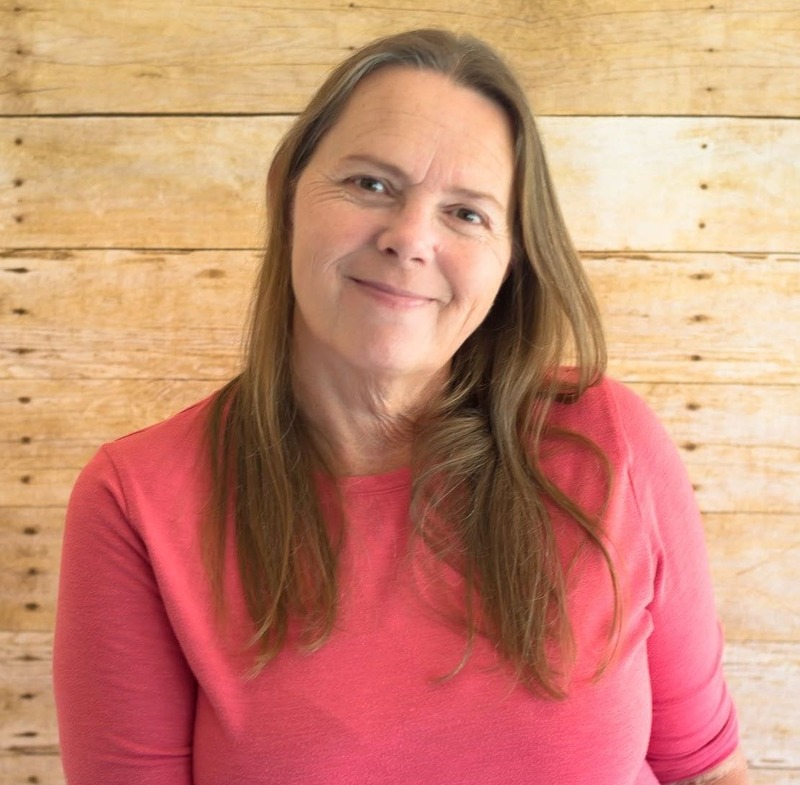 Love your step by step photos! How yummy! 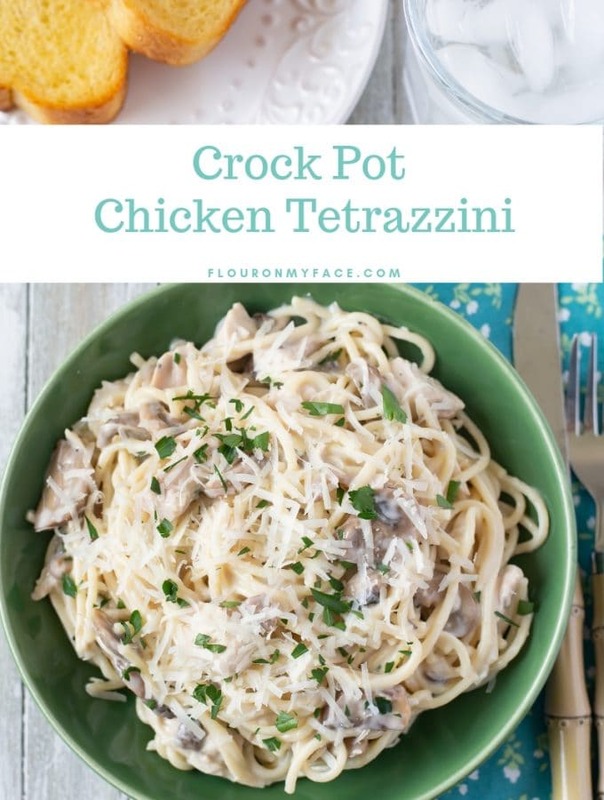 This would be so good with a big scoop of vanilla ice cream! Your Apple, Cinnamon, Streusel Coffee looks amazing! I’m going to have to try this. There is an error in your directions..I think it should read: add 1 cup of flour with the yeast mixture instead of 1 cup of water.. Sorry for the confusion. There is actually 1 cup of water missing from the directions. I added it and clarified thedirection. what a shame that this recipe is difficult to follow. It says to add the butter in pieces to streusel ingredients but doesnt list how much butter. More confusing is “add the oil, vanilla,egg,water. I am so sorry you had an issue with my recipe. My recipe writing skills have improved over the years. I have updated the recipe. Please print it out. I’m sure you will find it much easier to follow now. I have made this recipe tonight with fresh apricots instead of apples. It is cooling on my counter right now!